One thing we have no shortage of in the Stour Valley is woodland! The extensive ancient woodlands here are some of the largest in south-east England. This is a well-wooded landscape, with the exception of the Lower Stour- the marshlands east of Canterbury. The most valuable woodlands for wildlife tend to be ‘ancient semi-natural’ woodland. These sites have been continuously wooded since 1600, and in some cases may date back to the ‘wildwood’ – the primary forest which covered most of Britain after the last ice age. Our most wooded area is the Blean – a unique and distinctive landscape. At eleven square miles in extent it is one of the largest areas of ancient woodland in England. It is also among the most valuable – a third of it is of international importance for wildlife. The Kent Downs is also a landscape with many woods. There are large woodland blocks in the Stour Valley managed by the Forestry Commission. In places ancient woodland has been replanted with conifers but the tree you will see the most here (and in many other woods) is sweet chestnut – hundreds of acres were planted all over Kent during the 19th century to supply hop poles and fencing. While ancient sites tend to be the most valuable, recently established woodlands, whether planted or naturally regenerating, can provide good habitat. Scrub, in the right place, is excellent for many birds. 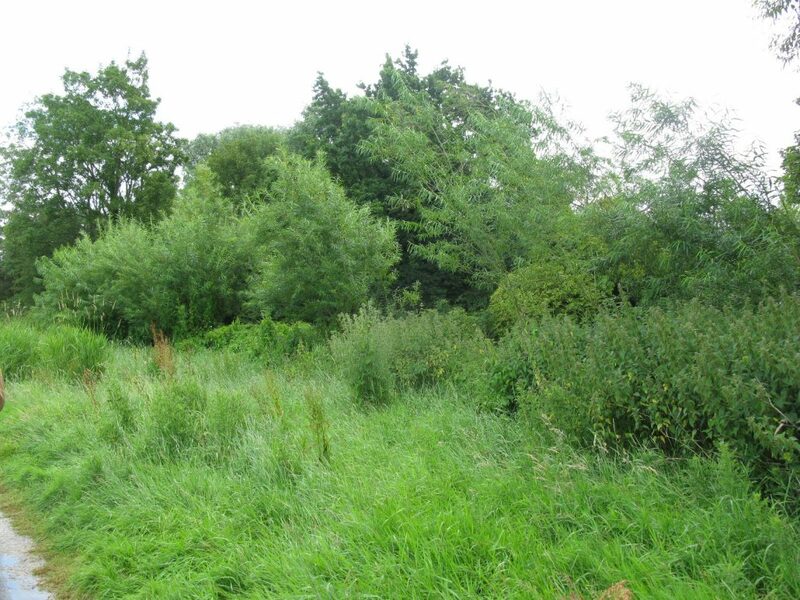 Mature scrub can become ‘secondary woodland’ which over time can take on some characteristics of ancient woodland. Plantations of broadleaved trees are replacing some of the woodland lost to development and agriculture. It’s worth saying, however, that neither secondary or planted woodland can ever be seen as a replacement for ancient woodland. Outside of woodlands, parklands are often the best places to see the very oldest, gnarliest ‘veteran’ trees. While large trees in woodlands will eventually be harvested for timber, in parks they are part of ornamental landscapes, so they are left to grow, sometimes for many centuries. Similar to parkland, wood pasture is a very special habitat of veteran trees and grassland. It is a rare habitat these days but examples can be found in the Stour Valley. Despite the fact that most have been managed by man for centuries, ancient semi-natural woodlands retain a link with natural woodland and are valued for their wild flowers, birds, mammals, insects and fungi. Unfortunately, many were lost during the 20th century, cleared for development and agriculture. The Stour Valley is very fortunate in having a lot of ancient woodland. Key to conserving this habitat is a technique called ‘coppicing’. This involves the repeated cutting of trees to a stump (or ‘stool’), which will then re-grow as many thin stems. This does no harm to the trees, in fact it prolongs their life, and is a traditional way of managing woodlands that provides a sustainable supply of wood and benefits wildlife. British woodlands have been managed in this way since prehistoric times. Large areas ancient woodland can be visited at the Blean Woods and East Blean Woods National Nature Reserves. Smaller but no less attractive ancient woodlands include Larkey Valley Wood and Dering Wood. Coppicing went into a slow decline from the 17th century, and was gradually replaced with modern forestry, particularly after the establishment of the Forestry Commission in 1919. The focus of forestry is fast-growing ‘crops’ of trees, typically non-native conifers. In some parts of Britain this led to the establishment of large new plantations of conifers. 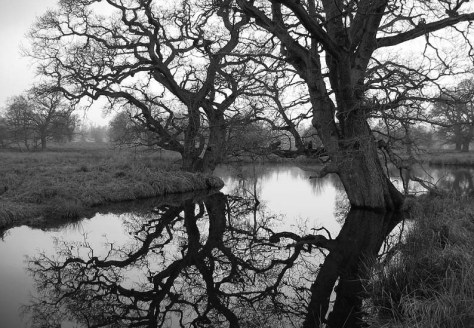 In the Stour Valley, the Forestry Commission tended to replant existing ancient woodland. Unfortunately, this led to some loss of ancient woodland characteristics, but many of these woodlands are still worthwhile wildlife habitat. 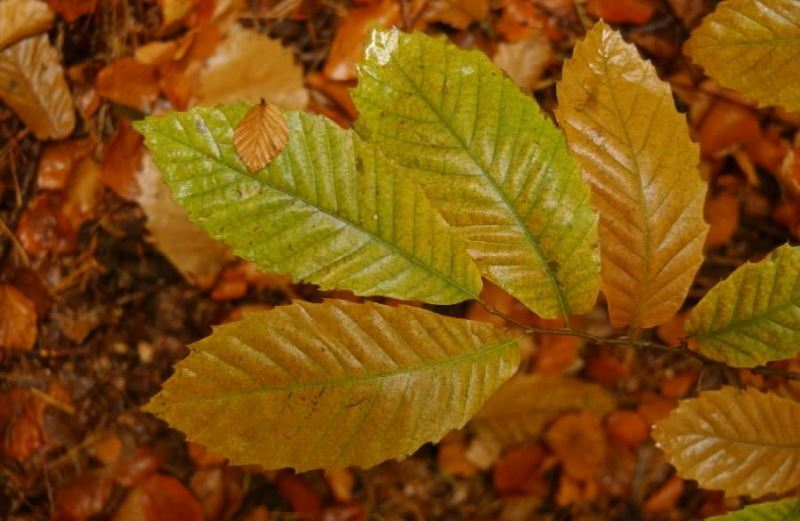 Native broadleaves were retained in places, and where they were replaced by beech or sweet chestnut the effect on ancient character was less. Sweet chestnut had already been planted in many woodlands during the 19th century and because it is managed by coppicing has tended to not to have such an adverse effect. Visit large forestry commission woodlands at King’s Wood, Denge Wood, Covert Wood and Clowes Wood. Scrub is a habitat of small trees and shrubs. It develops naturally wherever land is left unmanaged. In some cases scrub is a problem, for example on chalk downland where grazing stops and the land scrubs up, leading to a loss of species. However, in the right place it is an excellent habitat for species of all kinds. In particular scrub is habitat for some important bird species such as nightingales and various warblers. Sometimes scrub will go on to form secondary woodland. As it forms a closed canopy it may lose its value for birds, but will be used by other species and can become of conservation value – particularly where it is close enough to existing ancient woodland that wildlife can colonise. Scrub with value for wildlife can be seen in some areas of Wye Downs and Old Park. The value of plantation woodland depends a lot on what trees are planted and how. Plantations for forestry tend to be ‘monocultural’, i.e. all one species (often non-native), and uniform – planted in artificial-looking rows. New woods created for wildlife tend to be the opposite of this – they consist of many species, all native and suited to the local conditions, grown locally wherever possible, and planted naturalistically. While new woodlands can never be of as much value as ancient sites, they can offer good habitat for all sorts of wildlife, with different groups of species using it as it matures over time. 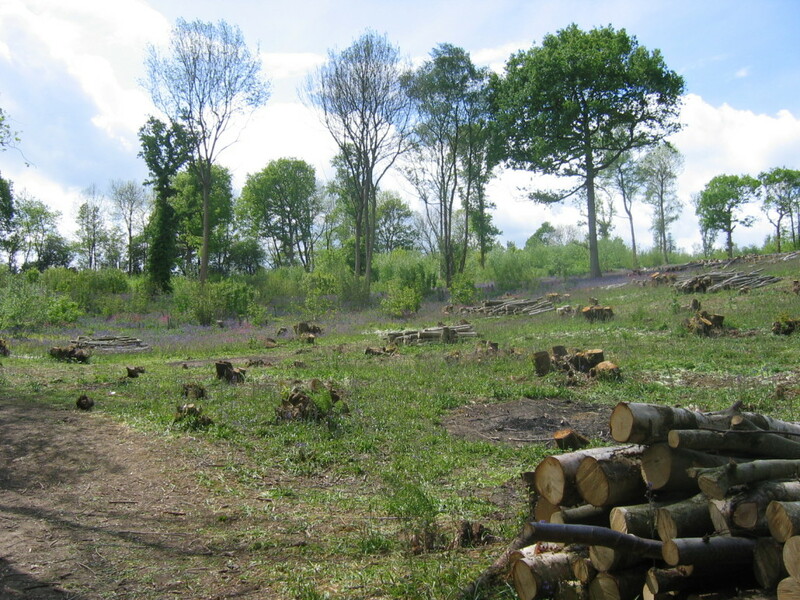 A good example of a new woodland can be seen at Ashford Community Woodland. The UK has more very old trees, known as veterans, than most other European countries. It’s said the reason for this is the continuity of old country estates with their ornamental parkland landscapes of old trees and open grassland. The Stour Valley boasts many lovely parks. 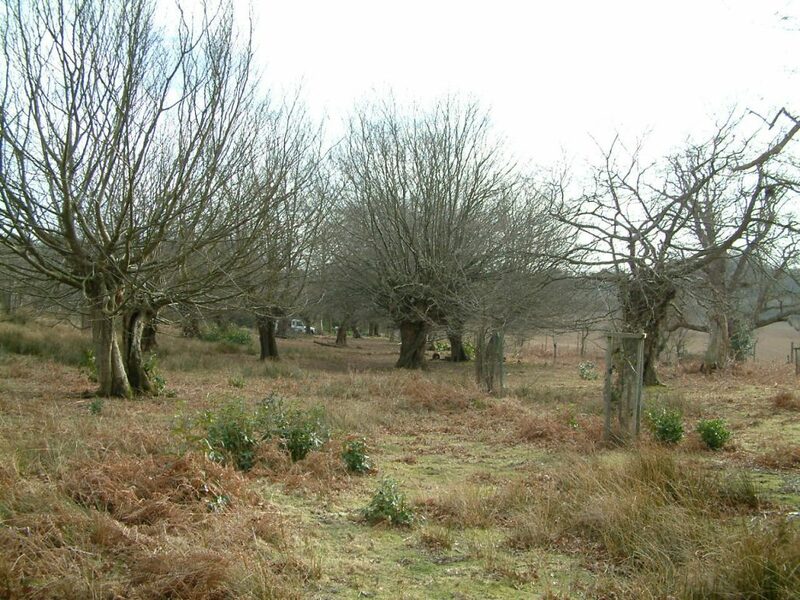 The veteran trees in parklands are habitats for fungi, lichen, birds and specialised insects. The grasslands are often long-established and never been treated with chemicals. Wood pasture is a traditional habitat that supplied both grazing land for livestock and wood from scattered trees which were cut by pollarding (cutting at head height, out of the reach of animals). 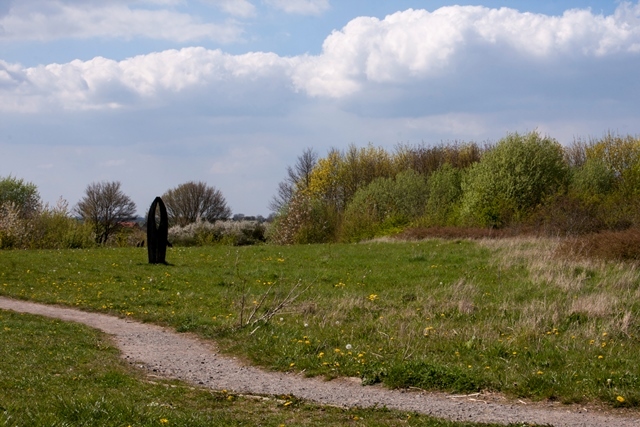 It is a particularly rare and valuable wildlife habitat for plants, lichen, fungi, birds and scarce insects that have adapted to the special conditions here. The veteran trees in wood pastures are like tower blocks for wildlife. Areas of wood pasture can be seen at Hatch Park. At Ashford Warren, wood pasture is being restored through clearance of young trees and grazing. The KSCP advise landowners about conserving woodlands. We help them both to obtain grant aid for this work, and carry out practical work at many sites.